The cold temperatures are no problem for this winter bird. As the winter months roll in, many animals begin their hibernation, many birds migrate south for warmer temperatures, and many people migrate indoors as well! 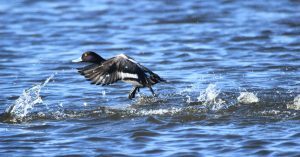 However the Lesser Scaup, along with other waterfowl, can still be seen diving for food in local bodies of water. 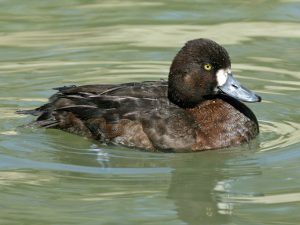 The Lesser Scaup, or Aythya affinis is a brilliantly colored medium-sized diving duck, common to North America’s coastal areas. These birds make their home in lakes, ponds, or estuaries, and can be seen congregating on bodies of water by the thousands in the winter. In fact, so many scaups will gather to one area, that from afar, they may look like a floating patch of vegetation! Included in their large congregation are the Canvasbacks, Redheads, Ring-necked ducks, and the similar in appearance, Greater Scaup. The Lesser Scaup may be easily confused with its similar-in-appearance relative, the Greater Scaup, especially because they are often seen together. The key way to distinguish the two is head shape. The Lesser Scaups feathers come to a peak at the back of its head, while the Greater Scaup has a rounded head. As is typical with bird coloration, the male sports a much more brilliant colored plumage than the female. 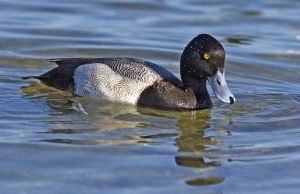 From a distance, a male Lesser Scaup looks simply black and white, but a closer inspection reveals a glossy black head, with a purplish sheen in the right lighting, with a black and white spotted back, a blue tinted bill, and yellow eyes. The female Lesser Scaup is brown in color with a dark head and a white patch above the bill. The similar feature between male and female scaups is the tall, peaked head, with a straight bill. Interestingly enough, the black and white coloration of the Lesser scaup is attributed to breeding males. The non-breeding males actually resemble a cross between a breeding male and female. They have the black head of the breeding male with the brown colored body of the female. Ducks can be further classified by their main method of finding food. Ducks can be divers or dabblers. The divers search for food deeper under the water, diving under the surface of the water to catch food. They often have larger feet and short legs. The dabblers typically skim food from the surface of the water, or lean forward to submerge their necks in shallow water. It is important to note that many ducks that dive will also dabble, just as ducks that dabble may dive as well. They are classified by their usual feeding methods. The Lesser Scaup is classified as a diving duck. In fact, it is the most abundant diving duck in North America, with a breeding population of 3.8 million. Lesser Scaup are instant swimmers. The chicks are underwater diving as soon as their down dries. When they are young, their buoyancy prevents them from being down too long, but as they get older, they are soon able to dive up to 60 feet. One might wonder, how ducks can keep warm when it’s so cold outside–sitting in near freezing temperature water at that! Ducks have an impressively simple heat exchange system in their legs pumping warm blood back and forth that keep their feet insulated and warm. Ducks, and many other birds for that matter, have a counter-current heat exchange system between their arteries and their veins in the feet. Warm blood going to the feet from the arteries passes right next to cold venous blood returning from the feet. The warm arterial blood passes heat to the cold venous blood, and becoming colder as it does so. The blood that eventually passes through the feet is cool. This results in the feet being just warm enough to avoid frostbite. The closer the feet are, in temperature, to the surrounding water and ice, the less the heat exchange will be! So keeping the feet relatively cold, actually prevents the duck as a whole from losing too much heat through its feet. Surprisingly enough, the duck only loses about 5% of its body heat through its feet, with the other 95% lost through its heat and body!